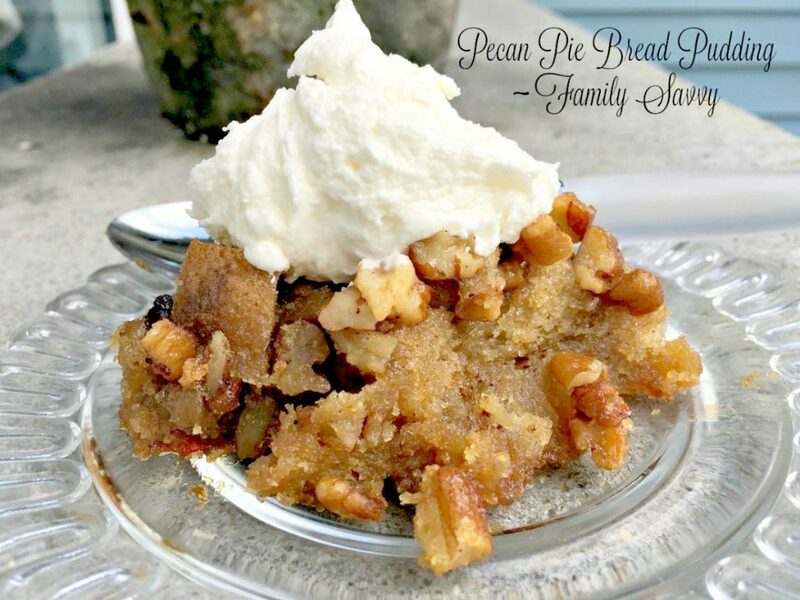 This pecan pie bread pudding has all the rich, decadent flavor of the well-loved Southern pie in an easy to serve, company worthy bread pudding. I simply adore this pecan pie bread pudding. It truly is every bit as yummy and delectable as pecan pie. It has all the richness, sweetness, and buttery flavor, but the base is breadlike rather than gelatinous. I find it hard to make a piece of pecan pie look pretty on a plate. Either the filling isn’t firm enough and oozes from the pie or I can’t cut it nicely and evenly. This bread pudding, though, looks fab just portioned onto a plate and topped with a dollop of cream. This recipe was shared with me by Zane’s mom~known to all of us as Mimi. She served this bread pudding last year at Christmas, and everyone loved it. The photo above is of Mimi’s actual bread pudding that I took outside to photograph to share on the blog. Mimi topped the bread pudding with a bourbon hard sauce, because her mom (MaMa to us) served hard sauce with many warm desserts. Mimi follows this tradition because “it brings back memories” for her of time spent around the family table when she was a child. Since I am not a fan of hard sauce, I prefer topping this with freshly whipped cream, sweetened with just a touch of powdered sugar. Canned whipping cream works fine in a pinch and is super easy to put on top just before serving. This bread pudding is a perfect Fall dessert when folks are hankering for flavors of pecans, spices, and richness. For more desserts to consider as the holidays approach, visit my sweet tooth pinterest board:-). If you give this bread pudding a try, let me know how you liked it and how you served it (hard sauce or other). I love hearing from readers and am so grateful for each and every one of you. As always, thanks so much for stopping by. Be blessed, and stay savvy!!!! Stir in the pecans. Pour evenly over the bread pieces. Use a rubber spatula to push and "prod" the bread pieces around in the dish until all are coated in the syrupy mixture. Bake at 350 ÂºF for 30-40 minutes or until set and just golden. Serve warm topped with freshly whipped cream! Hi Gunter! Thanks so much for sharing your adaptation; it sounds FAB!!! I am glad you love the recipe and made it your own:-) This bread pudding is truly hard to mess up LOL. Blessings to you for 2019 and beyond!!!! I made this recipe and will make it again. I did make a couple of changes. I used left over biscuits that I save in my freezer until I get enough for a bread pudding. I mixed all my ingredients in a bowl including the butter. I added an extra 2 tablespoons of melted butter. I added 1/4 cup evaporated milk. I also added another 1/4 cup chopped pecans. I then added the 8 cups of biscuit pieces to the liquid ingredients and mixed thoroughly until everything was well blended. I poured the mixture into a 9 x 13inch baking dish. I then let the mixture set for 1 to 2 hours for extra absorption. I then baked it for 35 minutes. It turned out wonderful. I served it with a praline sauce. When I make this again I might add a little bit more milk for extra moistness. This recipe is definitely a keeper.